I really enjoy participating in quilting challenges. 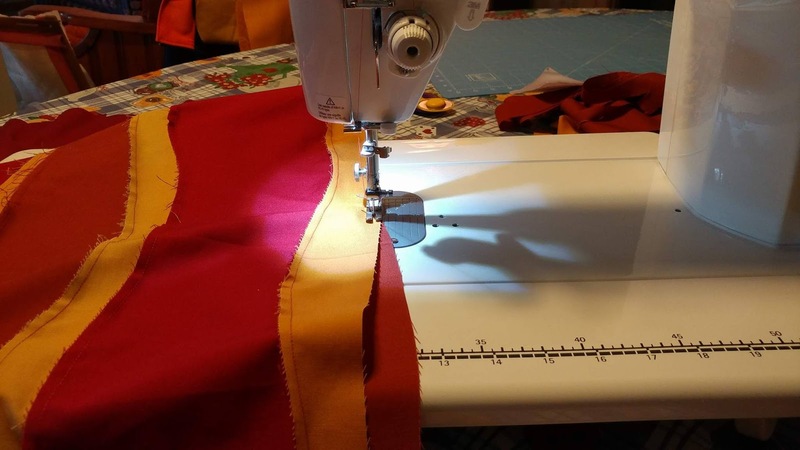 It lets me try new things and makes me push through to finish a project before the deadline. 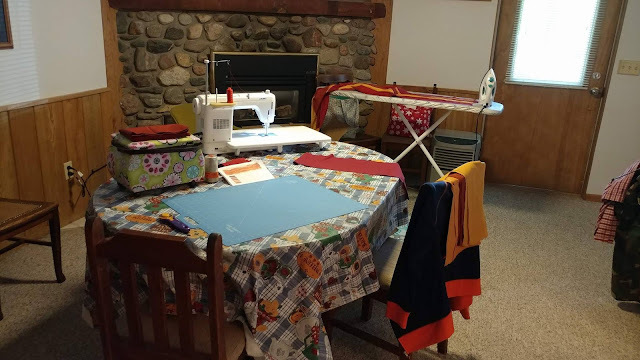 I enjoyed participating in the Project Quilting challenges earlier this year, and in the off-season, Kim of Persimon Dreams hosts a few other quilting challenges to encourage her readers to keep sewing. 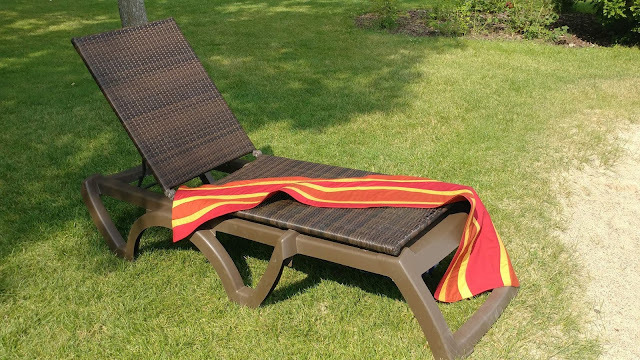 For July, the challenge theme was "Summer Sizzle." 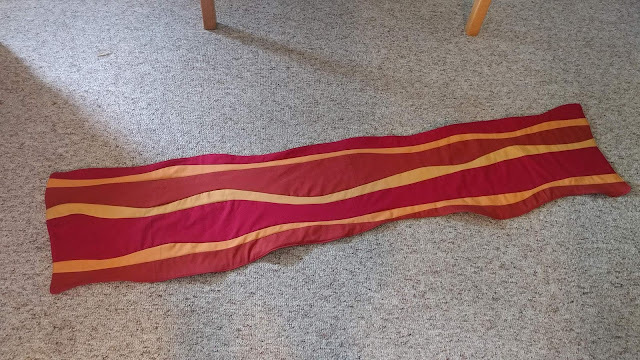 Well, it took me all of about 2 minutes to decide I was making a bacon quilt! 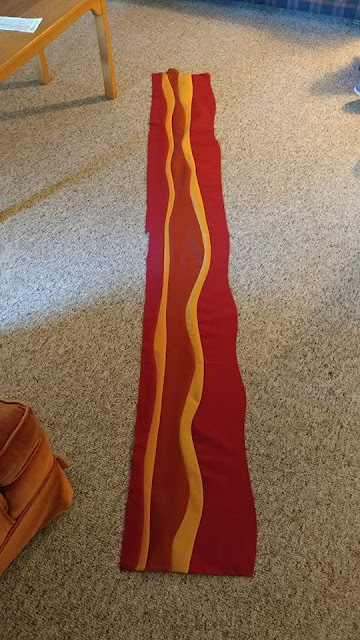 I knew I wanted to make a giant piece of bacon (have you noticed a theme in my quilts lately?? Giant watermelon, giant lemon, giant heart... 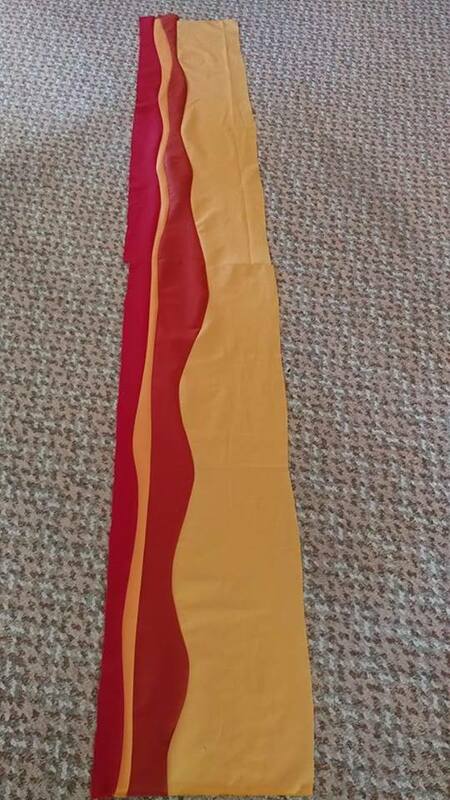 Giant bacon seemed the only logical next step!) I started by searching online for bacon clipart to find an image that I liked. Based on that image, I chose five different solid fabrics that were close in color to those in the clipart image. 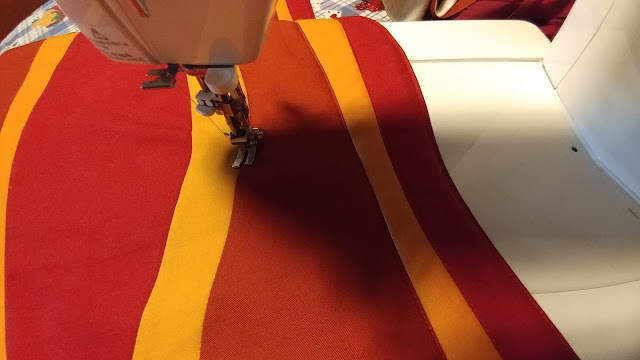 I decided that the purpose for the quilt was to try out something new, show that there can be humor in quilting, and that the quilt would be more art than function. Therefore, I chose to use fabrics that were easily accessible to me locally at Wal-Mart. I got 1/2 yard of each color, and an extra yard for the backing fabric. For our vacation, we spent a week at Brindley's Harbor Resort on Leech Lake in Minnesota. Once we arrived, I set up a little sewing studio in the basement of the house we were staying in. 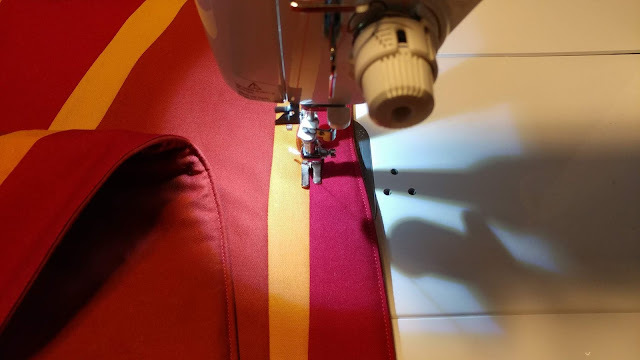 For most of the week, I was too busy enjoying my vacation to sew! We spent our days fishing, water skiing and tubing, participating in turtle races, playing bingo, etc. It was fantastic! 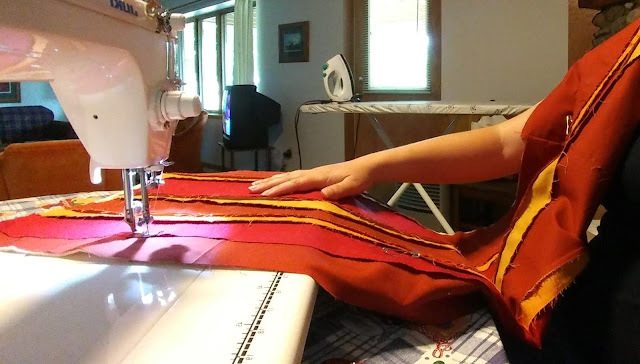 There were just a couple times that I snuck in a little sewing. This was my first foray into true improv curves! 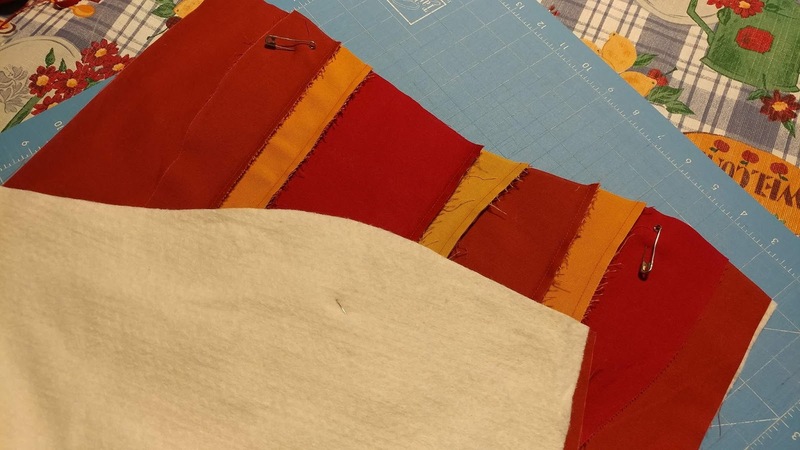 I started by cutting the half yard pieces of fabric into two quarter yard pieces. 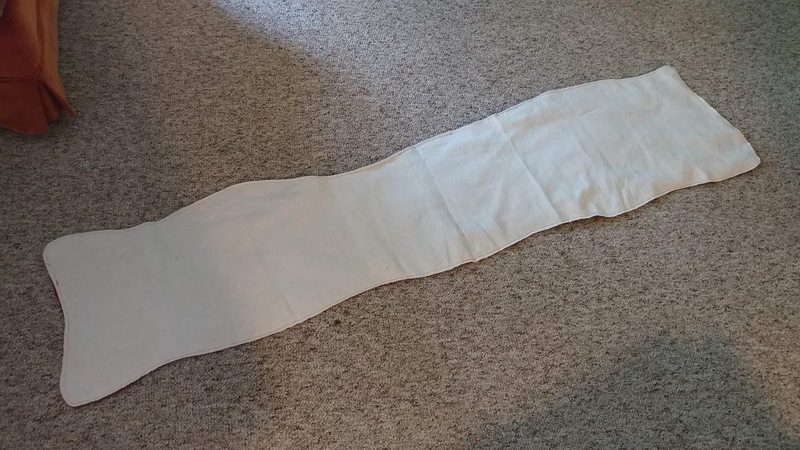 Then I sewed the selvages together to create a long narrow piece of fabric. 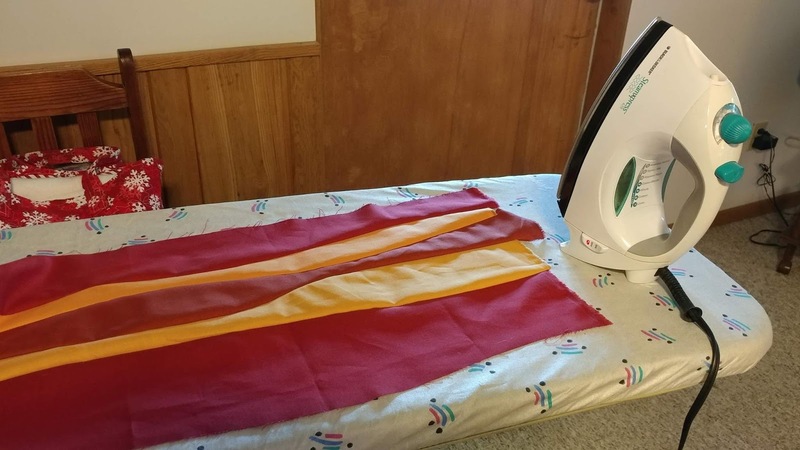 Then I layered two colors, both right sides up, and used my rotary cutter to cut a gentle wave on the entire length of both fabrics. 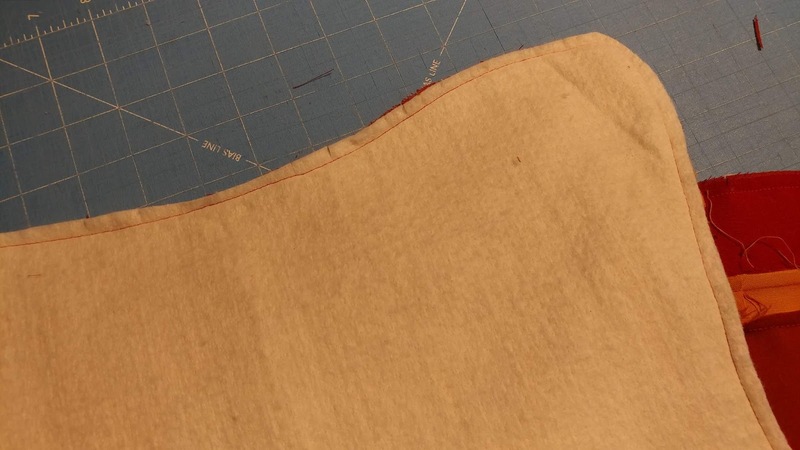 I then sewed the top piece of one fabric and the bottom piece of the other fabric together. 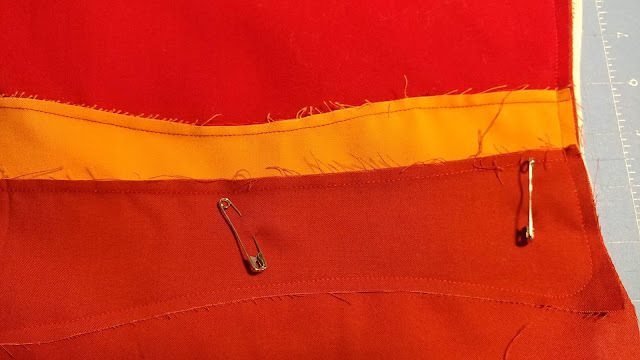 I didn't pin, I just lined up the edges as I went. A quick press was all that was needed to get the fabric to lay flat! I continued with the other colors using the same technique until I was to the last piece. Then there was trouble. 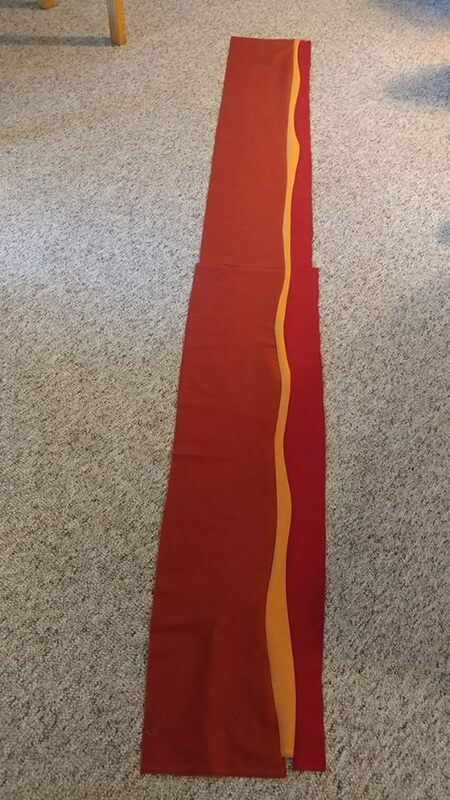 I'm not sure what happened, but the final fabric piece would not lay flat. It acted nothing like the previous four colors. The last seam was wrinkled and ruffled. I cut it off and tried again. Still the same. I wonder if it wasn't the same cotton as the other four colors (maybe it was Wal-Mart's even cheaper fabric that I avoid). 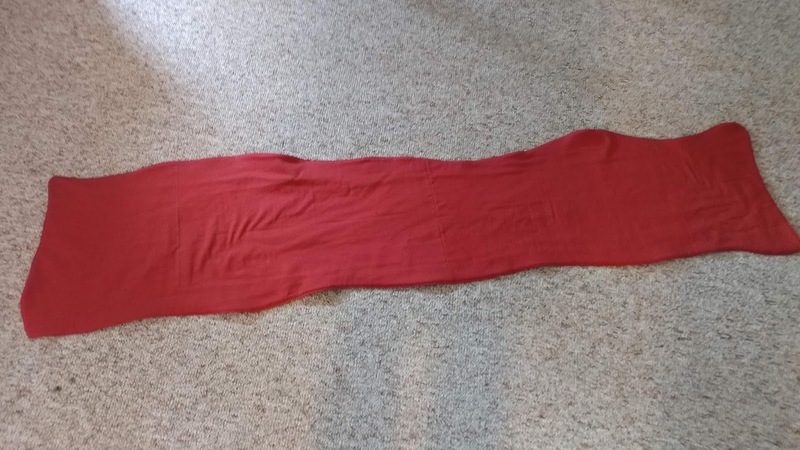 The WOF (width of fabric) wasn't even the same as the other four colors. I'm not sure, but I decided the best way to fix it was to just cut it off and not use it! 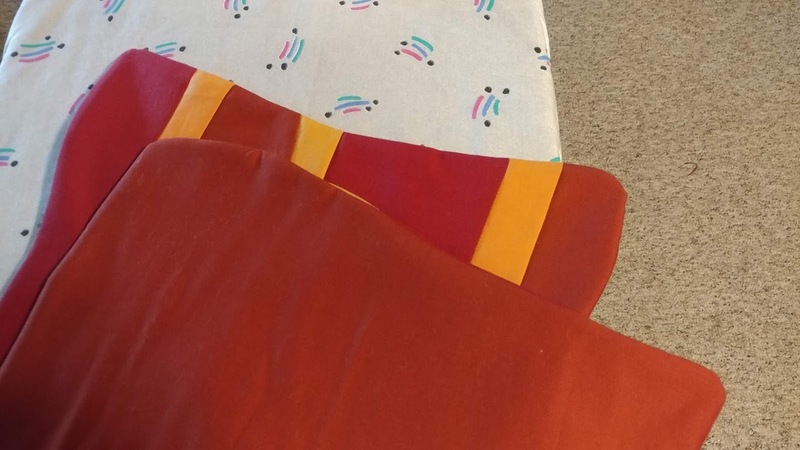 For backing, I used a one yard piece that I cut into two half yard pieces. 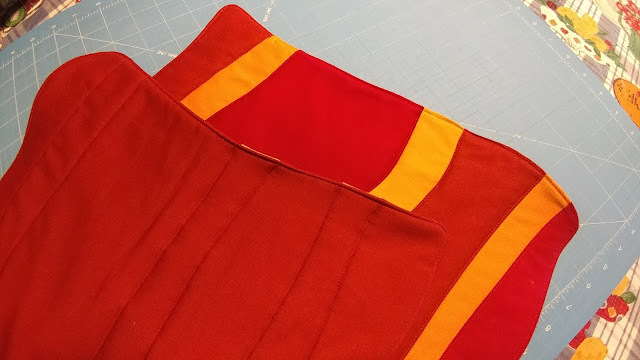 Then I sewed the selvages together to create a long fabric piece that was 18" wide. To turn the bacon into a quilt, I layered a long strip of batting (The Warm Co.'s Warm 100), the backing fabric piece right side up, and the bacon right side down. I used a few basting pins to hold the pieces together so they wouldn't shift. 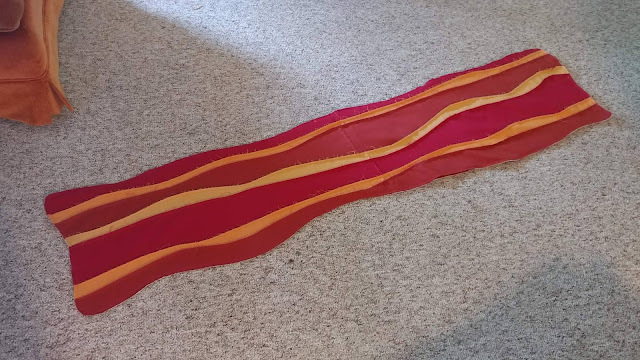 I also decided at this stage to cut the ends of the bacon to have some gentle curves too. 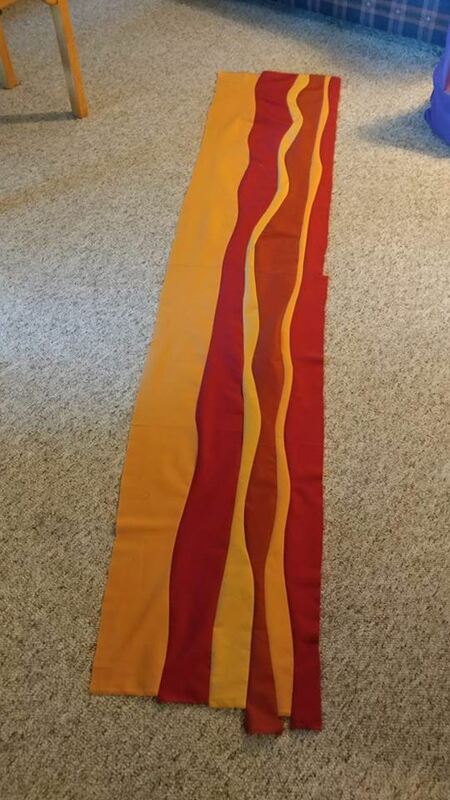 Then I stitched 1/4" from the edge of the bacon all the way around, leaving an opening about 5" wide on one long side. I trimmed off the excess backing and batting, then used scissors to clip about every 1/2" up to the stitching line along every inside and outside curve (which was basically all the way around!). After turning right side out, I pressed the edges well, then stitched about an 1/8" from the edge all the way around, including stitching the 5" opening shut. Normally, I would have switched to my walking foot to do the final quilting, but this was vacation! I just kept on my 1/4" foot for the whole quilt and put the pedal to the metal! 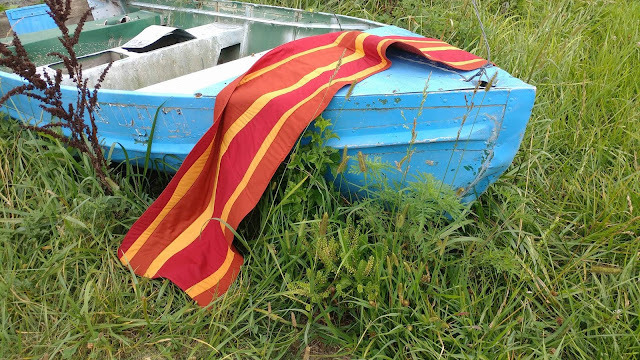 I then stitched through all layers about an 1/8" from the seam on all the dark fabrics to quilt the bacon. 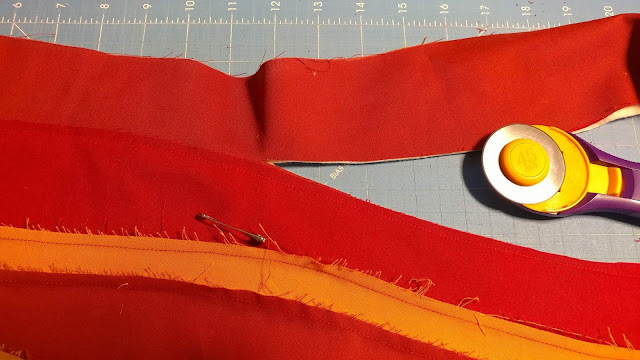 I used Aurifil 50wt in Dark Red Orange #2255 for both the piecing and quilting. 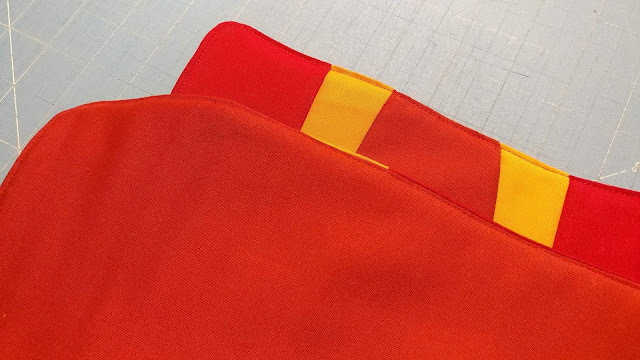 I love how the stitches are visible on the fabric, but at the same time, they don't stand out. Overall, I am super pleased with how this turned out! I am thrilled at how well the improv curves worked! The final piece of bacon is 14" wide and 64" long. It was pieced and quilted on my vacation on Leech Lake, Minnesota. Linking up to Summer Sizzle at Persimon Dreams, Main Crush Monday at Cooking Up Quilts, Wednesday Wait Loss at The Inquiring Quilter, Let's Bee Social at Sew Fresh Quilts, Needle and Thread Thursday at My Quilt Infatuation, Finished or Not Friday at Busy Hands Quilts, TGIFF at Celtic Thistle Stitches, and Finish It Up Friday at Crazy Mom Quilts. 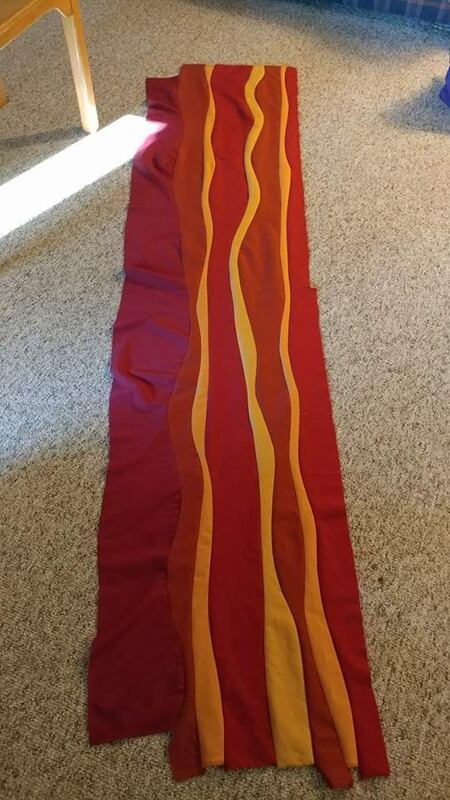 This is just the cutest bacon! 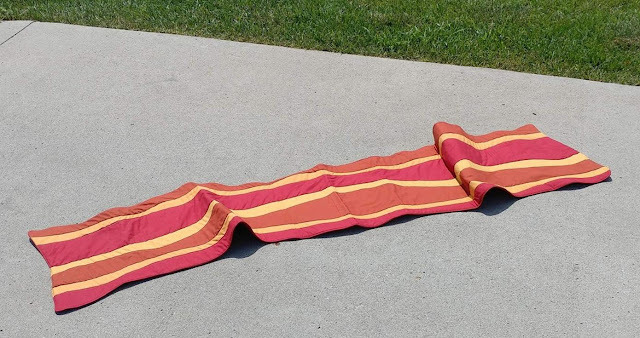 And now your family will say, "You know, the vacation where mom sewed a bacon"! Very clever, Larura! Great job! Wow. This one design is creative and impressive and I hope that following your guidelines, we will be able to stitch it easily. What a fun project. I'm so glad you are going for the humorous side of things. This idea was really great. 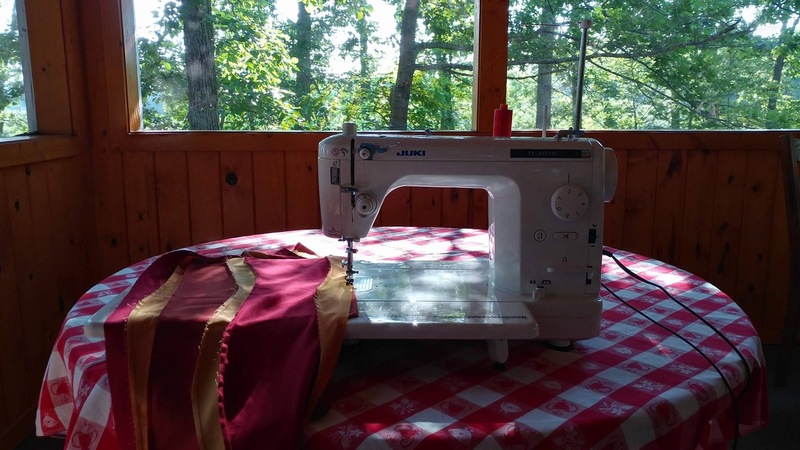 Curious to find out if you ever set the sewing machine up in the car. Ha, ha. 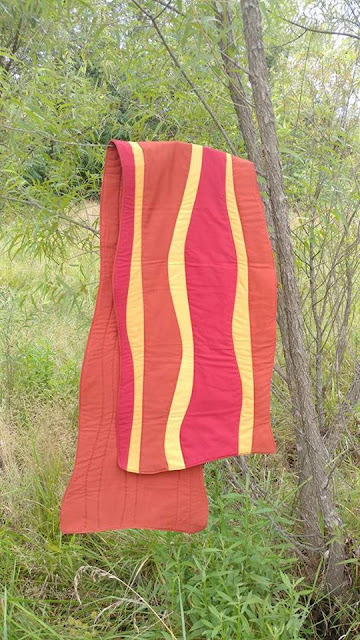 I'm waiting for the egg quilt, cause we can't have bacon without eggs!! LOL I *love* this! So fun. I can't wait to see what you come up with next. I think you're gonna start a food quilt trend! That is the coolest! 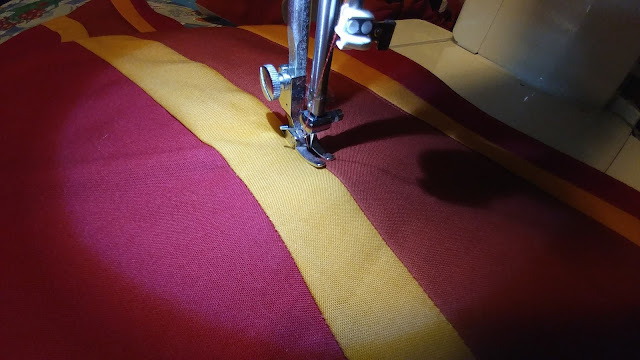 I was showing my bacon loving kids and one of them thought that the rotary cutter looked like an egg. :) Very cool. Isn't this fun! I love your free "jump in and try it" attitude. That's how I approach art quilts as well. Love it. 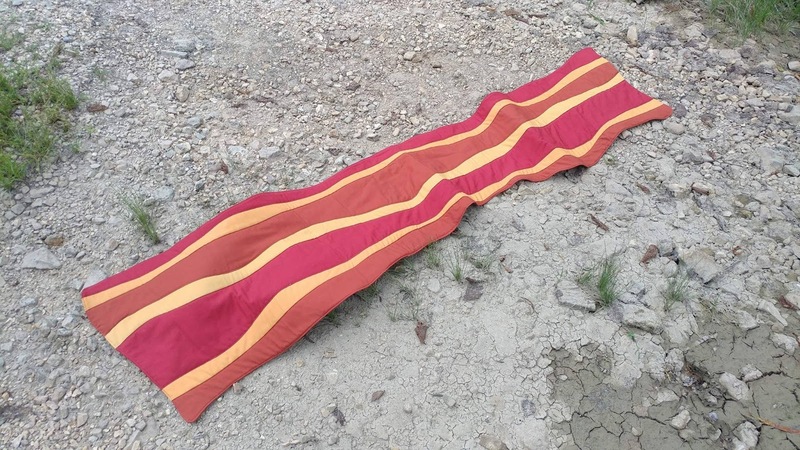 If I made it, I'd tell my husband that I was "bringing home the bacon!" Thanks for linking up to Wednesday Wait Loss. This is super cute and a great take on the theme! Yes!!! Now you need to make a pillow that looks like a fried egg, of course. Yummy! I laugh every time I see this! What a fun quilt! Yep! 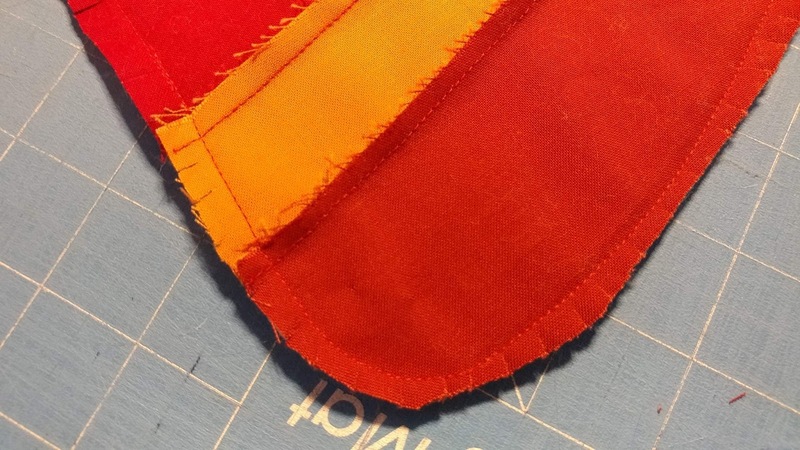 quilting doesn't have to be all seriousness all the time! Its so funny to see it 'sizzling' on the sidewalk! I don't know how I missed this post! 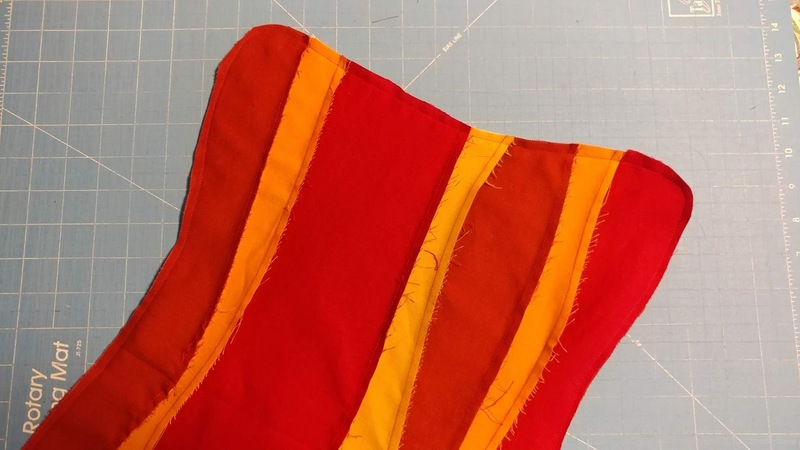 That is such a fun project to try your hand at a new technique. I really like that you flipped it inside out to close the edges instead of binding it. That's the perfect finishing choice for this quilt. Is it big enough to lay out on the beach with it? That is so cute. Thanks for all of the up close pics of the process. That was a novel idea. Just gotta have fun! Bacon? Oh noooooooo I'm vegetarian!! I can appreciate how you made it, very clever and it is fun really. Bacon was always the one thing I missed when I stopped eating meat, although at that point i wasn't vegetarian but my husband was and it is so much easier when you eat the same thing. However, I did get my bacon butties, when my grandson came, and you know what? I didn't like it, what a disappointment. Humus just doesn't have the same appeal somehow. Hee hee hee! No one can say you`re not original! And I think you should whip up a couple of fried egg pillows to throw on the couch with your bacon! This is so fun, and I can honestly say one of the funniest quilts I've seen! Brilliant! And, thanks for a good laugh. 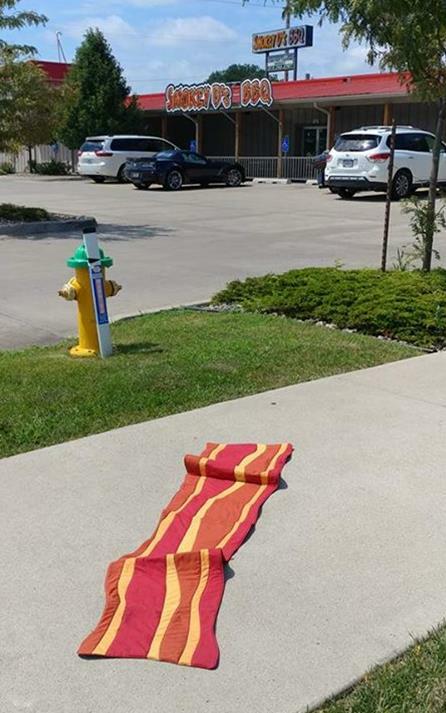 Enjoy your bacon. Will you be trying a fried egg next? I can see a whole series of breakfast food. French Toast? Waffles? Hash Browns? Oh how fun is this! It would be a perfect table runner for a brunch.